What does a Mossy Frog look like? The common name of the mossy frog gives an indication of its effective camouflage ability. These frogs have a rough textured body with a overall mottled green and brown colour, along with patches of black and red. They have a smooth underbelly and enlarged toe pads which aid climbing. Mossy Frogs reach an adult size of 6-8cm with females being the larger of the two sexes. Males are often more slender in appearance and do have nupital pads at the base of their thumbs, but this is not always distinctive enough to tell them apart. Each of the sexes has a different call, but again this is a difficult method unless observing them very closely. Where are Mossy Frogs from? Mossy frogs are endemic to the Tonkin region of Northern Vietnam. They have been recorded at around 3,000-4,000 feet altitude near the Man-son mountain. The Tonkin region is located on the fertile delta of the Red River. The area is also rich in its rice production. These frogs can be found mainly in the mountainous forests. How do you keep Mossy Frogs? Housing needs to be in the form of a large arboreal enclosure such as a glass terrarium. We would recommend no more than 3-4 adults in a enclosure size of 18x18x24". These frogs are semi-aquatic and will spend large amounts of time submerged and hiding under rocks, branches or large plants. We would recommend filling the base of the terrarium with de-chlorinated water and using a small sponge filter and air pump to aid water quality. Avoid using internal filters as we have found these to be to powerful in this sort of setup. Partial water changes should be performed weekly to keep the water quality at its best. Hanging plants, thick vines, branches, rocks and other decor can be added to create a natural environment. These will provide great climbing opportunities but also create natural hiding areas. Often when distrubed during the day these frogs will dash for cover. Something to bear in mind when arranging the terrarium. 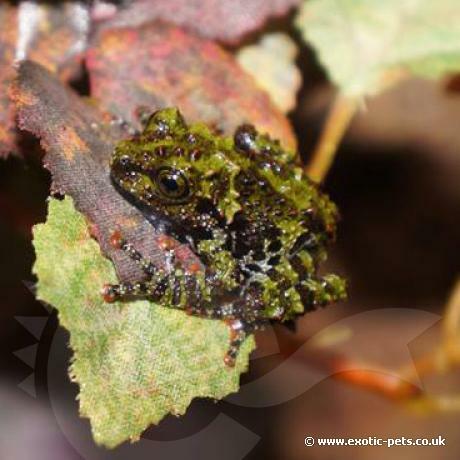 Mossy frogs are nocturnal and have no specific UV lighting requirements. They tend to shy away under bright light, so if offered it must be of low spectrum such as some of the natural daylight bulbs now on offer. The enclosure needs to be maintained somewhere between 18-24 degrees celcius. A daytime high in the low 20s to a small nightime drop is ideal. Maintaining water temperature is not necessary in our experience. We would recommend the use of a canopy top positioned above the enclosure with low wattage bulbs on a 12 hour timer; this will create a natural day/night cycle for the frogs. 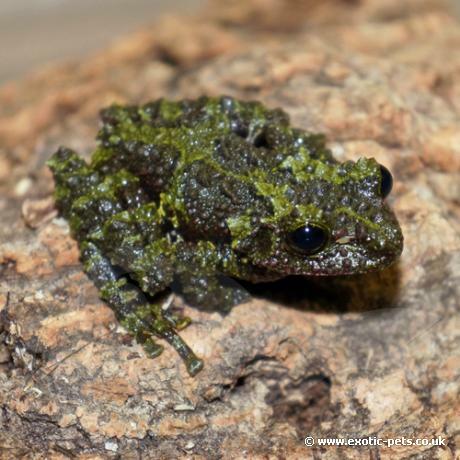 Mossy frogs are ferocious eaters; during our time keeping them we have witnessed many acrobatic leaps for food. They will readily take crickets, locusts and waxworm moths. Food should be dusted in a high quality calcium and vitamin powder, once weekly for adults and twice weekly for babies.